Step 1: Preheat oven to 375 degrees F (190 degrees C). Step 2: Place chicken in a lightly greased 9×13 inch baking dish and pierce with a fork. 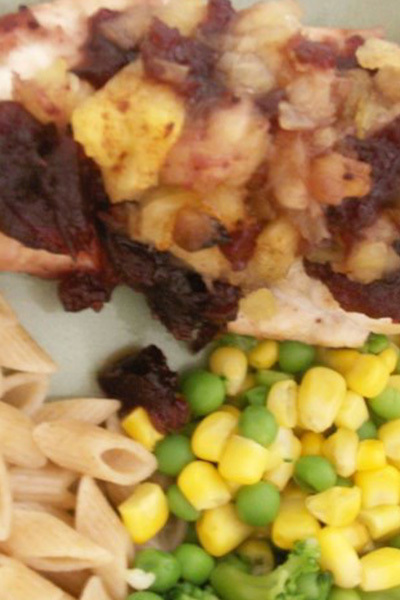 Layer cranberry sauce and pineapple over chicken and sprinkle with cinnamon. Step 3: Cover dish and bake in the preheated oven for 25 minutes. Remove, cover, and bake for another 15 minutes, or until chicken is cooked through (juices run clear). Enjoy this quick dinner recipe from AllRecipes!